Image Credit: ICRAR, NASA, ESA, the Hubble Heritage Team (STScI/AURA). After examining 11,000 galaxies using the Sloan Digital Sky Survey and Arecibo Legacy Fast ALFA survey, the team concluded that a process called ram-pressure stripping—which forces gas out of galaxies—is more common than previously imagined. 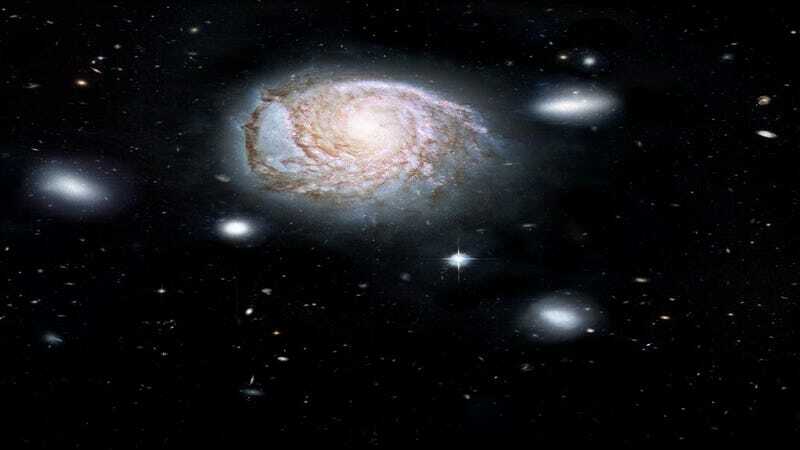 It’s a quick death, because without gas, galaxies are unable to produce more stars. The group’s findings were published on January 17th in the Monthly Notices of the Royal Astronomical Society. So, who’s the prime suspect in this crime? It’s none other than dark matter: the mysterious, invisible material thought to make up 27 percent of the universe. Turns out, it’s also quite the smooth criminal. “During their lifetimes, galaxies can inhabit [dark matter] halos of different sizes, ranging from masses typical of our own Milky Way to halos thousands of times more massive,” Toby Brown, the lead author of the study and a PhD candidate at ICRAR, said in a press release. The team’s research suggests that not only is ram-pressure stripping pretty common, it can happen to small and large galactic groups alike. It’s a tragic tale, but it could be worse: some galaxies get strangled to death. It’s a cold universe out there, but no one said the final frontier was for the faint of heart.